The third stage of this project is preparing the new instrument cluster for installation. You've got the replacement cluster ready for installation. But is it 100% ready to go? Most likely, you've gotten your hands on a used unit from eBay or a junkyard. It's a good idea to check it out before installing it...trust me. Speedometer Needle Spring - This spring is attached to the speedometer needle and is the spring that causes the needle to fall back to 0MPH when the car is not moving. This spring also keeps the needle from bouncing during normal operation. Some people instantly blame the speedometer cable for needle bounce, but this spring, if worn out, can also cause it. A good way to test this is to attach a drill to the speedometer where the cable attaches. Using a square-shaped screwdriver bit, you can drive the speedometer and cause the needle to climb as it would in the car. NOTE: You need to run the drill in reverse to cause the needle to climb. If the needle climbs smooth, then the spring is most likely in good shape. If not, you may want to find another speedometer, or have it serviced by a trained VDO service center. Attempting the replace the spring yourself is next to impossible. While your drill is attached to the speedometer, it is a good time to test the odometer. This is where my last cluster failed. A worn gear in the trip odometer was causing the whole thing to lose a mile for every twenty that I drove. Run the drill and watch to make sure the odometer is smooth and doesn't pause at all. Watch for the numbers to bounce and listen for any grinding noises. If you have any of these, get the odometer serviced, or find another one. Light bulbs - Now is the perfect time to test each of the bulbs and make sure they work before putting everything back together. Test each of the bulbs as shown below. If they don't light, then replace them with good bulbs from the old cluster. NOTE: The alternator idiot light needs to be a 3 watt bulb, because it's part of the charging circuit. The normal 1.2 or 2 watt bulb for the other idiot lights won't work. 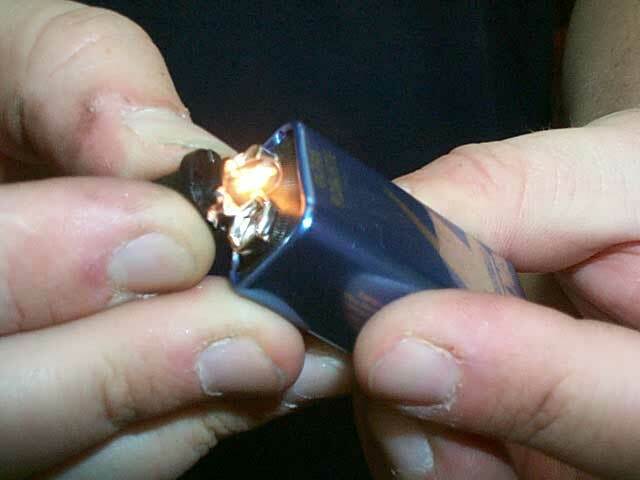 A 9-Volt battery held against the terminals of the smaller bulbs is a quick way to check if the bulb is still good. Use a piece of wire with the battery to test signal light bulbs. Many people notice that, as the car ages, the temperature and fuel gauge needles sometimes bounce while they're driving. Sometimes a loose wire on the sending unit, or even a failed sending unit can cause this. Most of the time, however, it is due to loose grounds on the back of the gauges themselves. Tightening the grounding points is best acheived with the instrument cluster out. 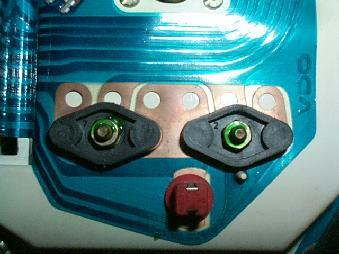 The ground points for the temperature and fuel gauges are directly behind the gauges on the housing. Use a 7mm wrench or socket to tighten the nuts on these ground points. Do not overtighten the nuts as they can crack the plastic and render the gauge useless.